"I just obey my husband, and that’s it! Obedience is the key to family happiness. You should have confidence in that. " "We have a strong link between the generations: We live with our great-grandma, my wife’s parents are next-door, our cousins are near, and so our family is sixteen in all"
Editor's Note: The Amish have been capturing the imagination of Americans for decades, startling them with their utter rejection of the 'goods' of modern life. The Russians have their own version of the Amish phenomenon in the face of the Old Believers, also called Edinovertsi (One-Faithers), who disdainfully turn down a sparkling, crude materialism in exchange for a strict, simple life. Old Believers are Russian Christians who did not accept the reforms of the Official Russian Church in the 1600s, Since then, they have maintained a strict, vividly separate culture and identity, settling in separate communities and farming the land. Old Believers usually have large families and dress traditionally; phones and washing machines are forbidden. Children do not attend school and are taught to read religious books in Old Slavonic, an old, complex language used in Russian Church services. Throughout the 20th century, religious persecution forced the Russian Old Believers to wander through countries and continents.Today, however, with the support of the Russian government, they have been slowly returning and settling in conservative communities throughout Russia. This is a series of mini-interviews with adherents talking about their lifestyle. This particular one explains how the Old Believers structure their families, and their adherence to a strictly conservative, unashamedly traditional, rules of family relations. The typical conversation on the patriarchal Russian family, by and large, begins with the Gospel and ends inevitably with The Domostroi. The work of Sylvester, written in the long-ago sixteenth century, until now partially, and sometimes wholly has a place to serve as a guide to family life. Of course, a full-fledged application of the rules of this monument of ancient Russian literature is extremely rare, often in the closed communities of the Old Believers, living far from civilization in rural areas. In Edinovertsi families today you can find various situations of home structuring: Society invariably influences us all. Although patriarchy has persisted, certainly not every woman is just a homemaker, and can stand with her husband among the breadwinners; but such situations are the exception rather than the rule. They are as relevant today as ever. 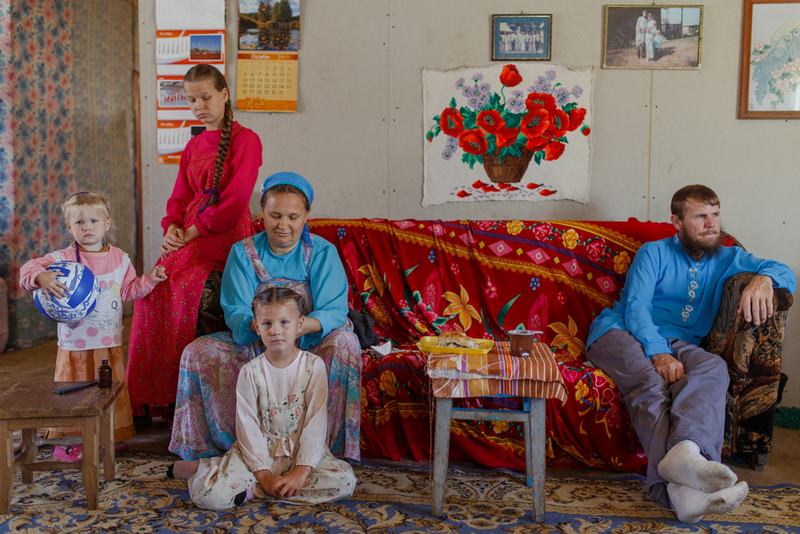 We decided to ask a few questions to simple lay Old Believers about the way of life in their “little church” today. Everything is like it is for all Christians: We try to live according to the Gospel, we pray the Midnight Office1 in the morning, and Small Compline2 in the evening, we go to church, and we strive to fulfill the typikon. The main principle in raising children is that children take an example from their parents. Therefore, it’s very important to watch, in the first place, your own spiritual life. One of the most valuable home traditions, besides prayer, I believe, is to read soul-profiting books together. We do this every evening in our family, at the table, after dinner. Such a practice has its roots in ancient Russian tradition, where people’s entire lives were “churched.” Children thus learn the word of God, and the family is united… around God! It’s a very powerful tradition. I’ll say right off the bat that our family is not ideal. We get up, we wash our faces, and (if suddenly there isn’t enough time) we say at least the long beginning,3 if not the Midnight Office. Everything here depends on what you establish. If you habituate your children, then they will pray. We sent to them a camp, where they had such a practice. The children themselves read prayers in the morning and evening, sometimes even in unison. From the age of six, my children, two sons, knew the little beginning by heart. It was on “auto” for them. My older son reads the long beginning now. If parents stand before the icons every day, then the children will do the same. One day, one of my sons, standing next to me, suddenly started reading Psalm 50 and the Our Father by heart. I was very surprised. One room in our home is reserved for prayer, and we have our spiritual library there. The whole family gathers morning and evening, we light candles, and if we’re serving the lay rite at home, we may light some incense. It was accepted in Tradition to teach a child to read the long beginning by heart—it’s considered a first and important step towards learning to pray. In ancient Rus’, and today with Edinovertsi and Old Believers, there were two main situations when a child should behave in an orderly manner—at certain moments in the services (the Creed, the Cherubic Hymn, the anaphora, the polyeleos, the Gospel), and at the table. There can be conversation, but without overindulgence. The table is, after all, also something sacred. In the old books it says that he who laughs at the table does not eat. We should keep quiet and read spiritual literature, and the meal will be reverent. And at public worship… Children are not forced to stand at attention the whole time. But there are some important parts where they have to be in church, and then they can run around outside! No one scolded the children in Tradition. Everyone understands that a child sometimes needs to release some steam, otherwise it could kill his faith. We have a tradition at home: I have read the Bible to my children in Church Slavonic from the very earliest age. The children knew the twelve Old Testament patriarchs by heart. I still sometimes read to them when they’re lying down. When I would rock my oldest, at about three months, I would sing the irmosi and ikoses4—in Znamenny chant, of course. As a result, my son sings with me on the kliros. Compline, the Hours, the Typika—he’s been reading all of this in church by his own desire since he was ten. My wife always covers her head before prayer. Ideally, a married woman should wear a povoinik6 at home, but this should never be compelled by force—everything comes with time and through love. Space in the home is arranged in accordance with Russian traditions. At home we have many traditional, embroidered towels, lace fringes on the beds, and rugs on the floor. There are crosses over the entrance to the house. We always do three bows upon entering and exiting the house. There are icons in every room; it is just as with everyone else. Stealing and lying should be very strictly put to a stop. Children should be raised with strictness, but with reason. Everything begins from love and fear before parents. From this are born love and respect. In our family, the children are accustomed to work; they wash their own dishes at home—always. The problem is that the way of life has been lost, and it’s all been destroyed. Society formed people before the revolution. Children were not especially reared! Games, relationships between our elders before our eyes, and the overall situation in the village played the role of instructors (In general, as happens now, the only difference being that “instructors” have, in many ways, taken on rather ugly forms—V. B.). But first of all, there are obligations! Obey your parents, for example. It’s worth it to teach children to take up some applied handicrafts. I learned how to bind old books. I see that my children watch it attentively. I sing on the kliros, and my sons are always with me. They stand through long services—at their own desire, by the way. Children always adopt something from their parents. That which interests parents will also interest their children—if it is something worldly, then your children will be interested in something worldly. Worldly things are necessary, of course, but to earn lots of money and successfully enter into marriage are not ends in themselves. All answers are given in the Gospel, which must be read together, and explained. And it’s always necessary to talk with children as with adults, without any baby talk. Any occurrence, they see, even on the street, must be given a moral assessment, that the situation would be understandable for children. In this is manifested child-rearing. You don’t need any lectures or constant prodding; but in life, in between those times when you’re faced with this or that situation, calmly analyze and discuss it. My wife adopted the tradition of showing the film, “Handicraft,” one episode at a time. It is discussed and triggers an interest in children. Our children are homeschooled. They studied at school, but we decided to take them out. Although, there are dangers in this, so there should be like-minded communities so they have someone to talk with, so the children wouldn’t feel like black sheep as teenagers. I have examples from the experience of other families, where the screws are tightened. Such children will then seek to break out of the family, find themselves in the world, and lose interest in faith. We must approach everything with reason. I just obey my husband, and that’s it! Obedience is the key to family happiness. You should have confidence in that. Of course, it doesn’t mean that my husband makes every decision and I have no right to speak. That’s absolutely not it. Important decisions are always made together; it happens that my husband asks for advice. We usually pray the Midnight Office—as it should be; if we oversleep, or something else happens, we read the Departure Bows, and we read the prayers on the way to work. It’s necessary to have a beautiful corner7 at home, and during prayers we put the analogion up. The lestovka,8 belt, katseya,9 and typikon are the immutable attributes of our prayer corner. I love to read with my husband. We’re a few books short of being able to do the full lay cycle of services, but we want to get them. I’m learning Church sewing, because I love to sew and embroider. We wear closed, light clothing at home. I don’t always cover my head at home. I would even say that I rarely cover it—when we pray or when there are guests. In principle, I don’t see anything especially objectionable in this: I’m a young wife,10 and young wives, as a rule, before the birth of their first child, don’t have to completely cover their hair in front of people. As I said, we have the practice of reading the lay services at home, from Vespers to Typika. Of course, on Saturday and Sunday we try to pray in church, but there are circumstances, and sometimes there is the desire to pray in church on weekdays. We try to go on pilgrimages, and we even explicitly plan out our free time so as not to succumb to idleness. I think an Orthodox family should not have free time. Of course, you cannot work on the Twelve Great Feasts, but for some reason you can’t find any time then. There’s the service, some little chores—and so goes every day. I don’t think our daily life seriously differs from the way of life of the majority of churched Russian families. I get up to quietly pray the Midnight Office; I have to get up a little early, while everyone is sleeping. Our older son (five years old) says his own prayers in the morning (from the beginning to the Creed, the bows, and “It is Truly Meet”). During the day we pray together before and after meals. In the evening before going to sleep—Compline (our older son himself reads the beginning, and listens until the canon to the Theotokos). Then he has his own set of bows. At the end of Compline we forgive one another. “Forgive me, for the sake of Christ!” “God will forgive you, and you forgive me.” “Christ is in our midst,” “He is and every shall be;” and the children go to sleep. I take the kids to church in turns—they’re still young (five, three, and one years old). Each one needs an individual approach. The most important thing is that their presence at the services is conscious and helpful, and therefore reasonably measured. When I sing, it’s somewhat hard to come with them, because I can’t leave the kliros and they start misbehaving in church. Children should always feel reverence for the house of God. We wear normal clothes at home (we don’t wear the traditional male shirts and sarafans). My wife is always in a long skirt. There are icons in every room and in the kitchen. We have all the liturgical books and an analoy at home, because sometimes, when we can’t get to church, we can pray the Church cycle at home. I try to sing to my children (especially before sleep). Since I’m the choir director, I mainly sing Church Znamenny chants, and sometimes spiritual verses. We read a lot with the children: the lives of the saints, the New Testament, and sometimes secular adventure classics for children. Our older son Sergei simultaneously learned to read in Church Slavonic and in Russian. He first learned the Slavonic alphabet (according to the ancient Russian method). We try to work with him every day on studying, explaining, and learning the liturgical texts by heart. He reads a children’s Bible in Russian for now. I communicate rather strictly with the children, but I try to give them as much time as possible. I think that especially important in raising a boy is the participation of his father. We try to reduce the playing of music at home to a minimum. We watch films and cartoons with the children on Sundays and for good behavior. It’s important that the center of the life of the soul of each of us would be communion with God, not worldly vanity. We have an ordinary family, where there are babies, children, and teenagers. Everything is different for each one. We commune when possible and we try to pray in the morning and evening according to the old rite. The children are not very immersed in Church matters—our older daughter doesn’t go to church willingly anymore. The younger ones are more willing to go to church. We try to keep all the fasts. It is very important to preserve peace, mutual understanding, and love in a family, accepting children as they are, not imposing anything upon them. Things can still be shaped until thirteen years of age, their path then beginning. We can remain older and trustworthy friends, or be tedious and authoritarian enemies. We allow our kids a lot; they love life and they want to see it, and to learn and choose their own way, as we did in our time. But things are good for them because their parents are firm in their convictions and they are faithful to their principles, which is a protection and support for them. We celebrate all the Orthodox and national holidays either with family or friends. We always take our children with us on pilgrimages and trips—it’s a good example for them and good memories for the future. We have a strong link between the generations: We live with our great-grandma, my wife’s parents are next-door, our cousins are near, and so our family is sixteen in all.